Most people know that the Toronto Police released a 474-page report on October 31, 2013 that describes their ongoing investigations of Rob Ford’s activities as well as the activities of several of his associates during spring, 2013. There was an instant uproar across all news media, including the Twittersphere and the blogosphere. The posts focused on the content of the report: who did what when and where. The why and how will emerge during further investigations and trial proceedings. The commentaries have not, however, addressed the report’s form and its possible influences on ways that the audiences make meaning. Most people will experience the report by proxy through news reports. They will get a reduced and summarized version because they understandably won’t want to read the entire 474 pages. They will get a shortened version of Chief Blair’s press conference, highlighting his statement that a retrieved video file is ‘the one described in previous press reports’ and Blair’s saying that he is disappointed by what he is reporting because of its effects on the city. But the shortened, highlighted news reports will still contain portions of the original texts, specifically editorially chosen images and words. Media literate consumers will reflect on and be aware of the forms and their messages. Blair’s press conference was delivered as an uninterrupted statement with one camera focusing on Blair and sans props, slides or videos. He spoke to the results of the investigation directly, using carefully chosen words that avoided opinion and prejudice. Chief Blair took questions at the end of his announcement, at which time he made his famous ‘I’m disappointed’ statement. In spite of the fact that most of the questions included the words ‘the mayor,’ Chief Blair said ‘mayor’ only once. The form of the conference significantly influenced its message. Blair stood in full uniform in front of a Toronto Police backdrop. He was not seated, not in a suit, not at a table, but spoke non-stop, soberly with eye contact that sent a message of power and control. The context of the conference is also telling. It is evergreen because its recording was posted to Youtube on the Toronto Police Services channel in HD, there for all to see at their convenience. The form of the police report is also significant, particularly in terms of its images and redactions. Its 474 pages contain 40 entirely redacted pages. There are many images, most in colour but some night shots in black and white. 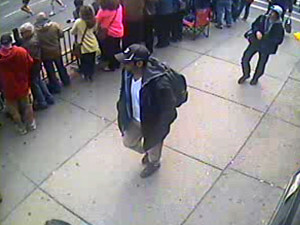 Some of the images speak for themselves, while others have been annotated with red circles and ovals around significant elements. Where might readers have previously seen similar imagery? In police or military press conferences describing the actions of criminals or enemy forces. Such images depict grainy figures in sometimes damaged surroundings, the visual qualities of which often make them more threatening than the high-quality imagery of people in colourful advertisements or sporting events. What connections might readers make when they see images in the report whose forms are reminiscent of images of terrorism or criminality? 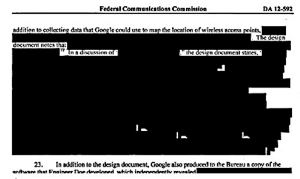 The report, also available in its entirety, contains numerous redactions of varying sizes. Each redacted box contains “IP – innocent party” in red lettering. 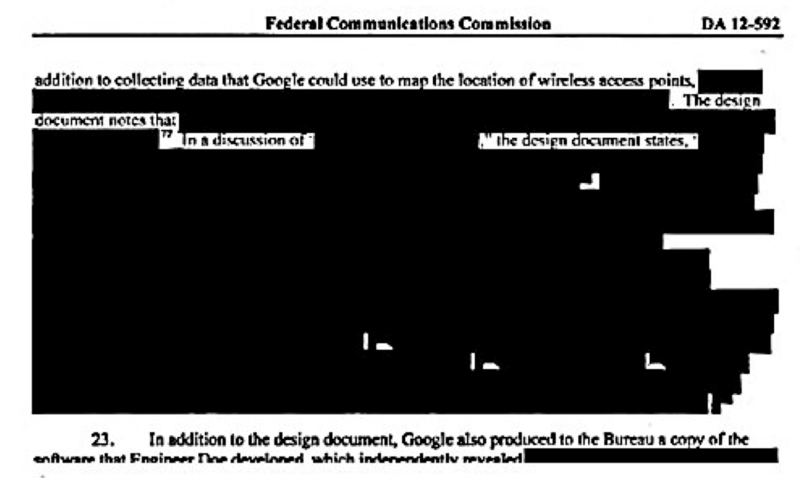 Where might audiences have seen redacted text before? I.e. what prior knowledge might they have of this graphic form? In official documents released under a freedom of information act request. These documents are redacted to protect national security, innocent parties, etc. What is our typical response to missing information? We love guessing games. Horror, thriller and mystery movies are filled with dark corners and disguised characters to titillate our curiosity. Newscasts describing unidentified bodies or body parts compel us. So we transfer those responses to the redactions, which engender questions in our minds. Questions such as: What information is missing? Who might it implicate? How? How might audiences transfer these prior responses and suspicions to the redacted portions of the Rob Ford police report? What information might they imagine to fill in the redacted sections? Will their imagined information be favorable or unfavorable to the mayor’s reputation? 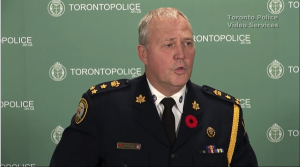 The content of Chief Blair’s press conference may confirm the existence of a video depicting Toronto’s mayor freebasing and a confirmation that a suspect has been arrested and charged with extortion concerning that video. But the form of the conference—the uniform, sobriety, backdrop—carries another message that evokes a variety of responses, depending on the viewer: alarm, suspicion, embarrassment, empathy, anger (none of them neutral). But the form, the very existence of a police report that describes a mayor’s actions, sends a message that is not sent by a newspaper report of the same actions. 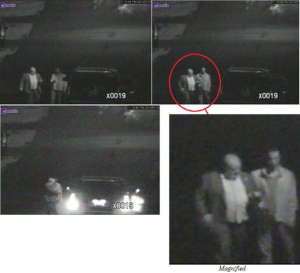 Grainy photos of people and vehicles taken from hidden or aerial locations remind us of real and fictional depictions that connect to crime, mystery or political intrigue. Redacted text raises suspicious responses because of our past experiences of redacted text. 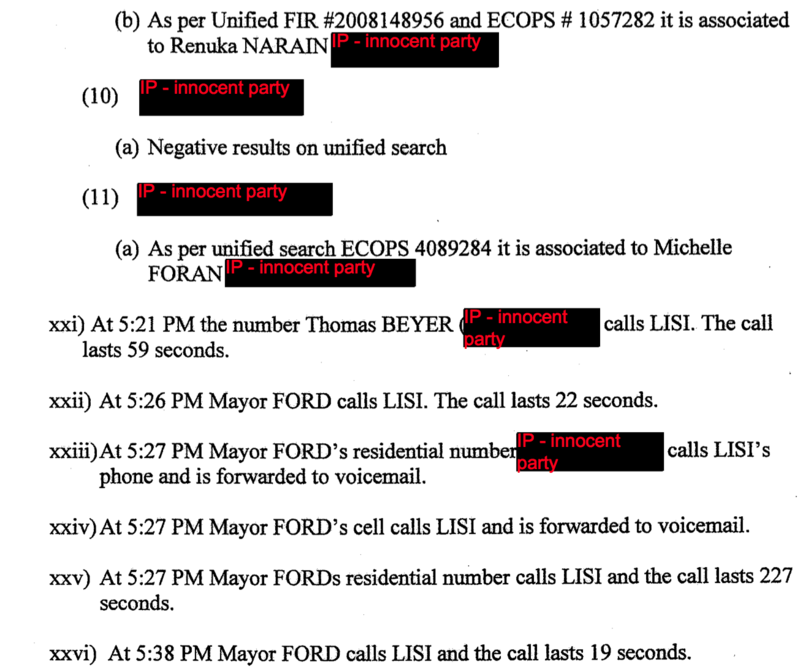 Chief Blair’s vague and careful allegations and the police report’s photos and redactions further damage Ford’s mayoralty, but more in what their forms communicate than what their contents state. 2 Responses to "The Medium is the Message, Mr. Ford"
Ford Nation abhors the media coverage, and continues to (mostly) support the mayor, even after his confession today. How do you account for their immunity to all the negative messaging?